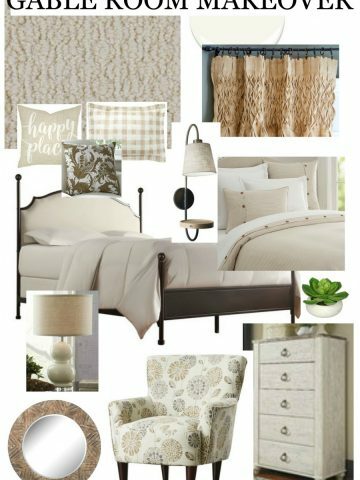 I am s-l-o-w-l-y working on the Gable Guest Bedroom at StoneGable. We are giving it a much needed “spit and polish”. Just some overdue changes to keep it fresh and ready for our cherished guests. The Gable room is one of two guest rooms here at StoneGable. The larger Guest Suite, with it’s own bath and back stairs, is home to our adorable niece Courtney right now. Her just-out-of-college job brought her here to our town and she is staying with us. So right now we are down to one guest bedroom. 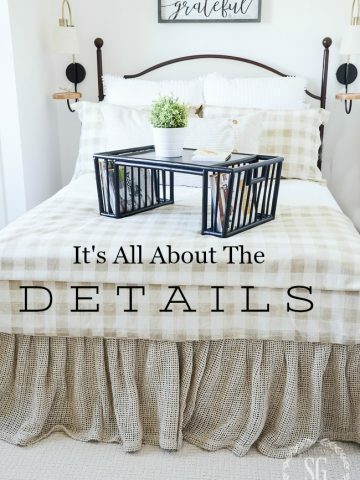 Because this room is not huge, it is important to decorate it keeping our guests in mind. Not too cluttered… with plenty of room for luggage and drawer and closet space for clothing. I am in the process of editing! Gone are the curtains (waiting for white plantation shutters), antique cedar chest, stuffed chair and matching ottoman. 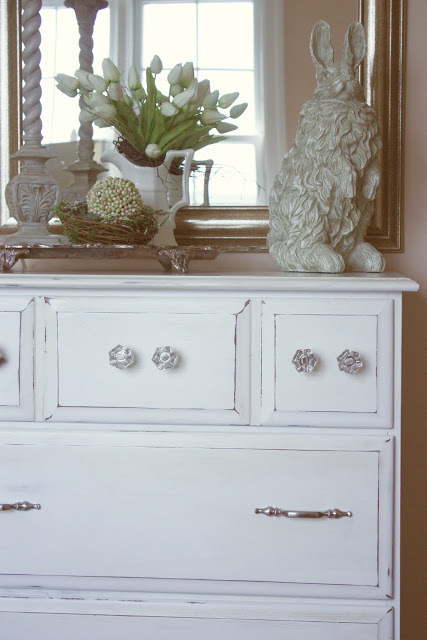 The little dresser in the Gable Room was given a whole new look with white paint… click HERE to see that transformation. 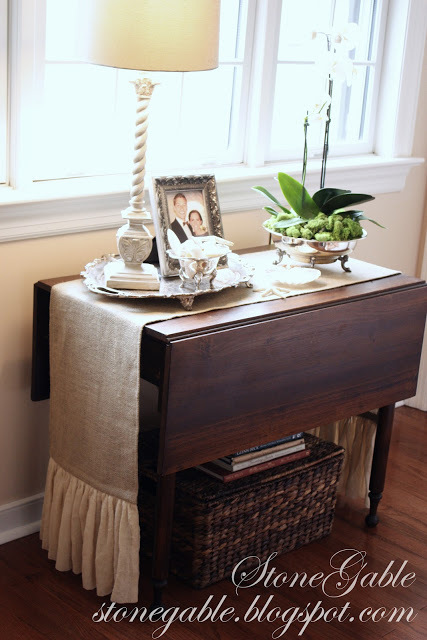 On an local antiquing trip last year, Bobby and I purchased this wonderful little drop leaf table. At the time we did not quite know where it would go. But eventually, it found it’s home… in the Gable Room. This is NOT a piece that I would ever paint! It’s patina comes from years and years of use. 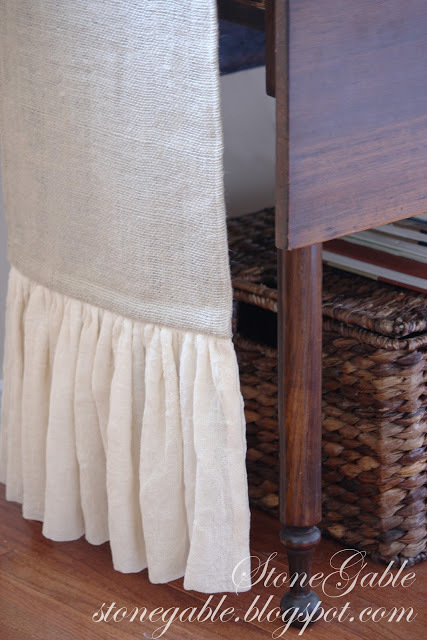 A burlap and scrim runner from BEYOND THE SCREEN DOOR INTERIORS is laid across the table and falls gracefully to the floor.This runner is beautifully made. Please visit Sonya, she has so many stunning things on her site! 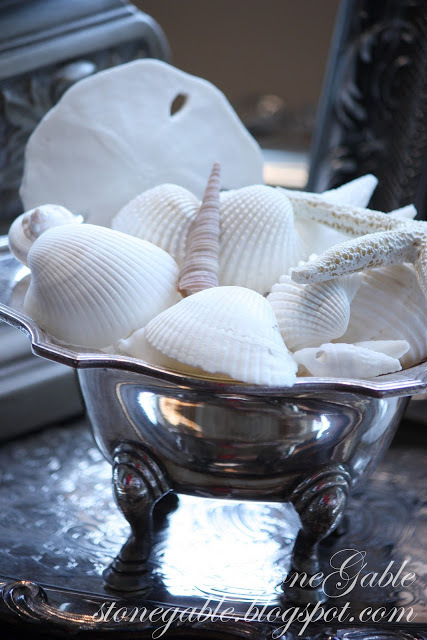 A vintage silver footed tray holds a tall thin lamp, a picture of our next guest to StoneGable and a silver bowl filled with white shells. The lamp is going to get a little makeover too… look for an upcoming post. One thing I like to do when our guests visit StoneGable is to find a picture of them or a loved one and display it in a pretty frame. I think it makes people feel special and cared for. My son’s lovely girlfriend will be our next visitor. I got this picture from facebook. It was taken at her sister’s wedding last week. I think she will be surprised! When my guest go home they can take the framed picture with them. I am always on the lookout for nice inexpensive frames. I think this one goes well with the lace in Miss A’s dress. I hope each picture we send home will remind our guest of their stay at StoneGable. An old silver bowl with bathtub legs hold pretty white shells. I like to add a little seasonal decor to each room at StoneGable. Orchids stand tall in a silver serving bowl that belonged to my mother when she was a bride. I LOVE orchids…. and silver. Both have found a happy home next to this bright window. A large shell sits ready to collect change from pockets or jewelry. It’s nice to have a little catch-all on a table for guests. A large basket filled with fluffy white towels slides under the table. Once the guest have their towels they can then hang them up in the bathroom. It is our goal that all visitors to StoneGable feel warmly welcomed, loved and pampered. And when they leave they can’t wait to come back again! I do’t know how one could not feel welcome in your guest room. 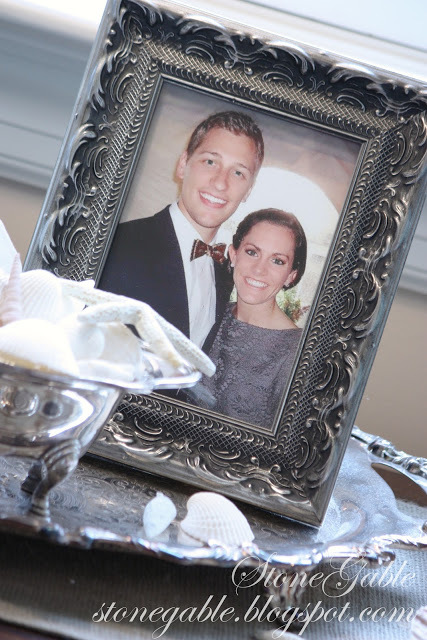 I love the idea of having a framed photo of them waiting for their arrival and allowing them to take it home. How smart of you to get it off of FaceBook! We need to plan our summer visit. Unfortunately, I don’t have a guest room. I love your idea of the personalized photo in the guest room Yvonne. I hope you don’t mind if I copy. What a beautiful sun-filled room. The chest looks so pretty with the vignette of pretties on top. make it part of their Welcome Basket….You certainly are the hospitable queen! What a beautiful room ~ and I was so happy to think that I did something for my guests that you do ~ I always look for a picture of our guests too, BUT ~ I never thought to let them take it home as a remembrance. What a gracious and lovely idea. I usually try to put a photo that contains all of us at some time or another, so it would make a thoughtful gift. Thank you so much Yvonne for once again bringing hospitality to the next level. OH what a gorgeous and warm room…any guest would be so pleased to stay there. I love the picture idea! What a nice touch to add to an already beautiful table! Can’t wait to see it all finished! What a beautiful guest room. I just love all the beautiful touches. Your guests are the luckiest people. It’s all beautiful and very much my taste. (but better…) I love the touch with the photo and will remember that. 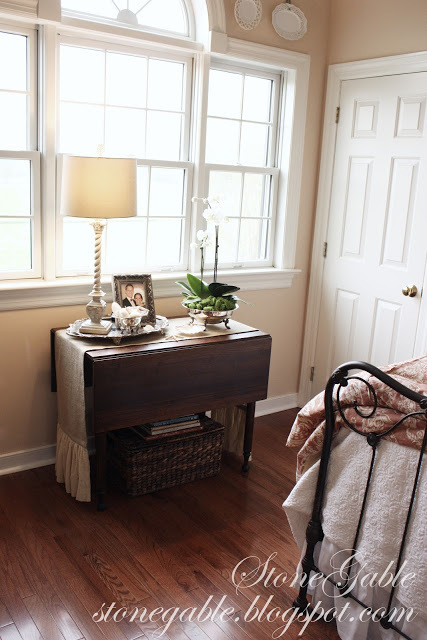 What a precious vignette in your Guest Room! I know your guest fill pampered and loved as they come for a stay! What a caring, thoughtful idea to frame a photo of your guest for their room! The lovely frame truly enhances this photograph! I’m sure Miss A will treasure it and bring to her remembrance her stay @ StoneGable! gorgeous! 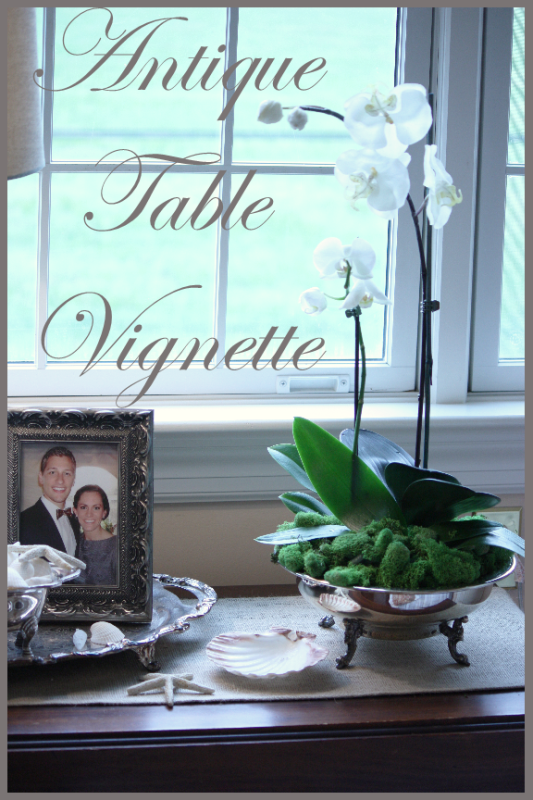 love the table, and the vignette you placed on it. 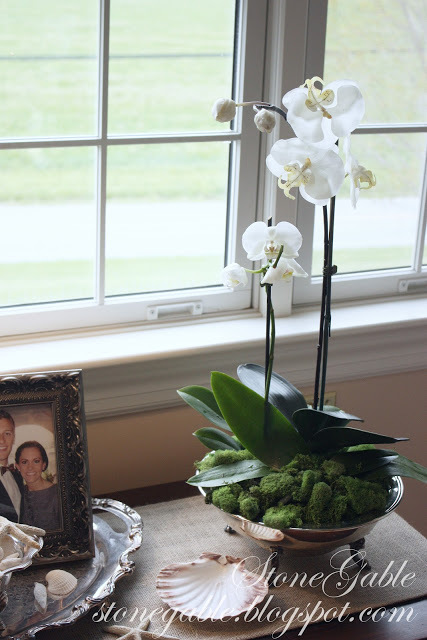 I adore orchids, too, and yours is gorgeous in the silver planter. I’d love to stay in such a gorgeous guest room! It’s been awhile since I’ve visited your blog, but I am glad to have found you again. 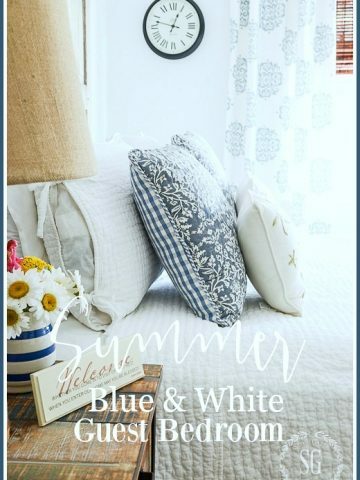 Truly, yours is one of the most beautiful blogs in blog land!! I love your picture idea! What a delightful, personal touch. Wow, Courtney is a lucky/blessed gal to be calling Stone Gable home for now. What a blessing to be experiencing your hospitality and graciousness first-hand. Wish I was coming for a visit. What a beautiful vignette. I honestly don’t know how you ever get your guest to leave! I know I wouldn’t! What a lovely table! You decorate your home so beautifully. Love the picture of the guest placed in the room- nice touch!!! Like how the room is calm and relaxing. I put more energy into my guest rooms than all others. Want my guests to feel all cozy! Very pretty, Yvonne! 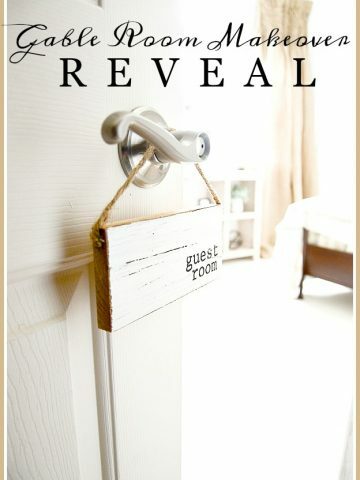 Wonderful idea to have a picture of the guest out. I think your vignette is just the right amount of decoration, too. Total perfection…I am a sucker for silver and adding orchids is the crowning touch. Beautiful Yvonne! I have always kept a frame in our guest room too that I fill with a photo of the visiting guest. But I never thought to send it home with them. You are such a clever girl! Yvonne, What a sweet room – anyone would feel welcoming love there! Thanks for sharing such a wonderful space. What alovely hostess, you are Yvonne! I love the idea of the pic of your guests and letting them take it home. You’re so very thoughtful in your special touches. I know a lot of us would love to be a guest in your wonderful Stonegable. You are just the hostess with the mostess! Love your son’s bow tie! How thoughtful and lovingly created! I adore drop leaf tables as well. What lucky guests! Your guest room is lovely, Yvonne. I love olden drop leaf tables. So warm! Yvonne I am making my reservations right now!! 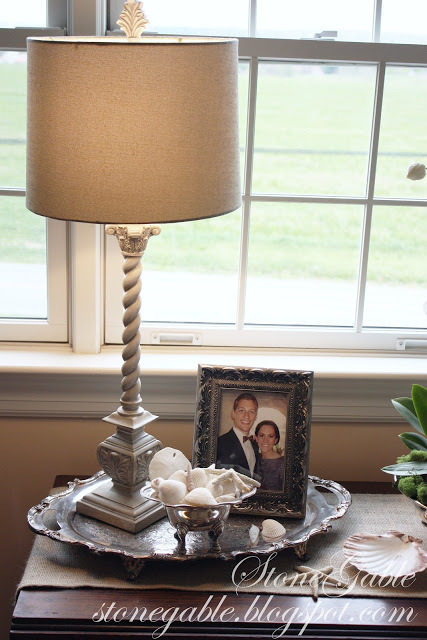 Love that table and the beautiful vignette you created!! Can’t wait to see the full reveal! What a special time your guests have in store for them! Your vignette is lovely and I adore the idea of putting a framed picture in the room. That idea I’m going to steal. The bed and chest are just perfect and I can’t wait to see what you do with that lamp. The runner on the table is wonderful too. I love your sweet vignette! What a wonderful guest room! 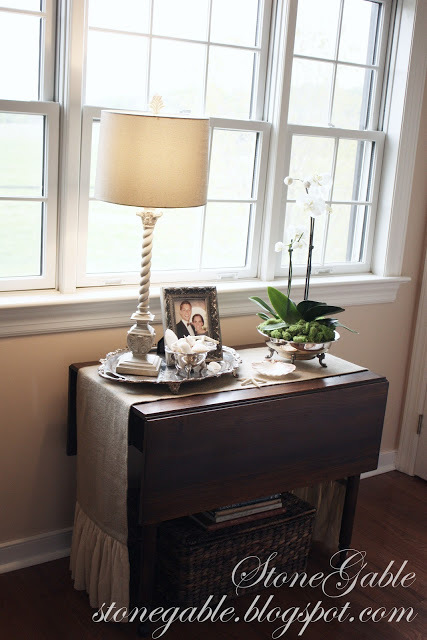 Love the drop leaf table and the beautiful vignette you placed on top. Love plantation shutters and can’t wait to see them.